Having passed 38 winters, and commencing my 39th, one of the hardest parts about aging is that my verging on middle-aged appearance no longer matches the tousle-haired child I still feel like inside. 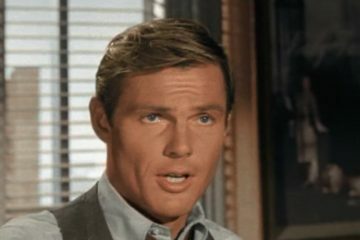 Bearded, balding, and bespectacled, the deceptively confident facade of one who appears to know what he’s talking about when, say, discussing brake drums with his mechanic more often than not conceals a scared little boy who would sometimes rather wake up one morning to find that this unpleasant “adulthood” business had been merely a bad dream. But “recapturing one’s youth” may be an equally bad idea, and to prove it I have embarked on a seasonal viewing project these weeks after Thanksgiving of 22, that’s right, 22 vintage Christmas specials; many of which held my youthful fascination on TV, as a child of the mid-80s, between the approximate ages of 5 and 12. Some I have seen, and some I am viewing for the first time, but all are in that unique vein of televised animated cheer that dominated children’s holiday programming from the early ’60s to the early ’00s. 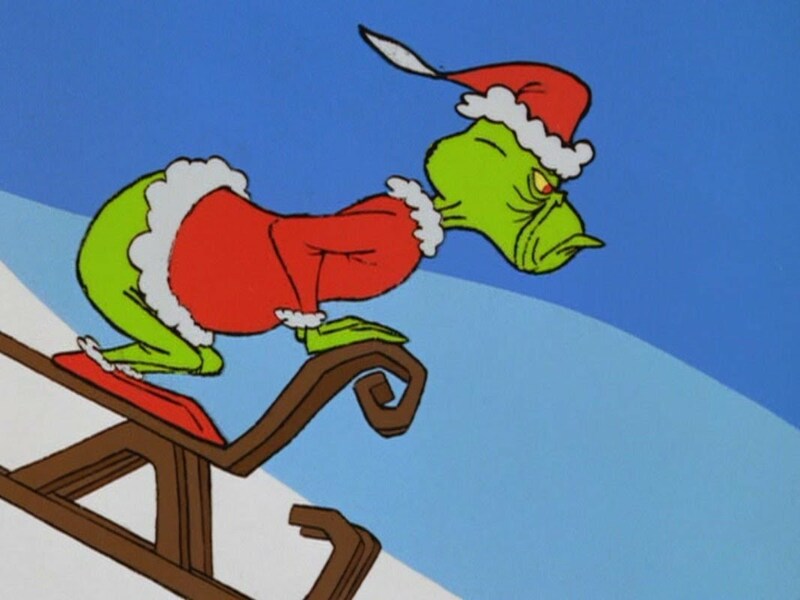 Do the likes of Rankin and Bass, Mr. Magoo, the Peanuts Gang, and various versions of Santa Claus himself hold up for a self-admitted Grinch, a self-avowed Scrooge, who is re-viewing/”reviewing” these self-same festive properties upon approaching his fourth decade? Join this grouchy guy’s Christmas to find out! 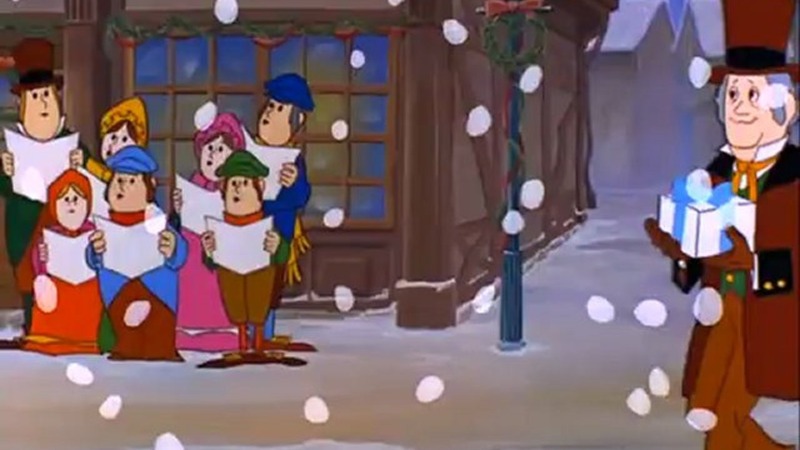 Near-sighted, eternal klutz Mister Magoo makes a perfect Ebenezer Scrooge in UPA’s inaugural holiday special, an animated adaptation of Charles Dickens’ A Christmas Carol that proved remarkably faithful to its classic source material. 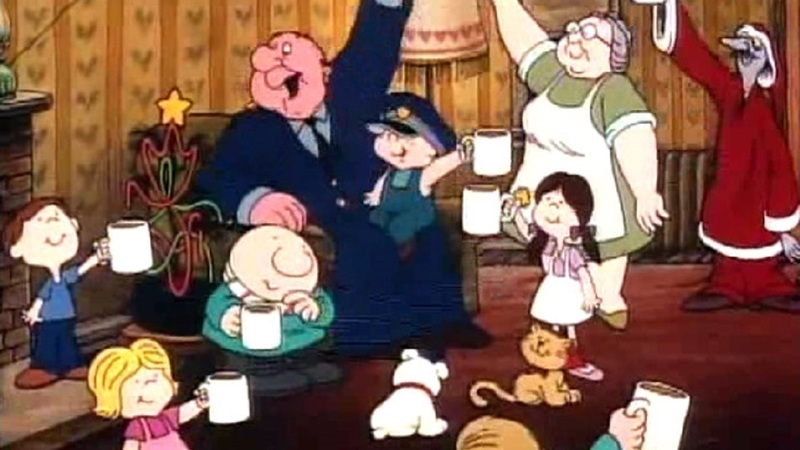 A long-time favorite of the baby boomer generation, Mister Magoo and his squint-eyed view of Victorian London is actually a good deal more tolerable than many live-action versions, and retains enough of Dickens’ peerless prose, and dramatic impact, to seem funny, vibrant, and even touching 54 years after its original NBC broadcast. Entertainingly framed by Magoo the cartoon character performing the role on Broadway, much of the special’s offbeat fun derives from the special’s tuneful score by Jule Styne and Bob Merrill, who would soon go on to write the 1963-4 smash Funny Girl. (Jim Backus as Magoo as the elderly Scrooge’s duet with his childhood self, “Alone in the World”, remains a highlight for this viewer.) 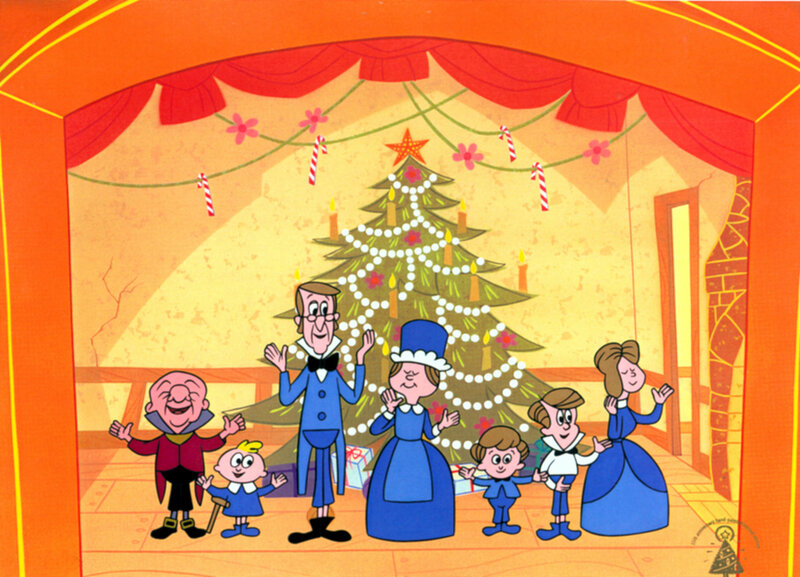 And while one wouldn’t think that such whimsical inventions as “razzleberry dressing” and “woofle jelly cake” would fit well into the grim Dickensian milieu, Mister Magoo’s Christmas Carol nonetheless pulls off the near-impossible feat of making animated goings-on appeal to both adults and kids; and therefore remains something of a gold standard for animated features, holiday specials, and small-screen musicals. 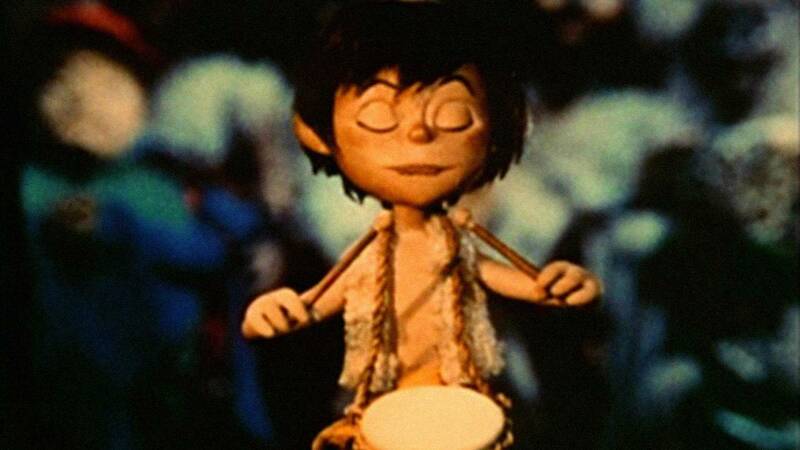 Possibly the first Christmas special I encountered on TV, and probably the first Christmas special that springs to mind when one thinks of, well, “Christmas specials”, Rankin and Bass’s initial offering to seasonal stop motion animation is charming and quirky enough to be viewed any time of the year. 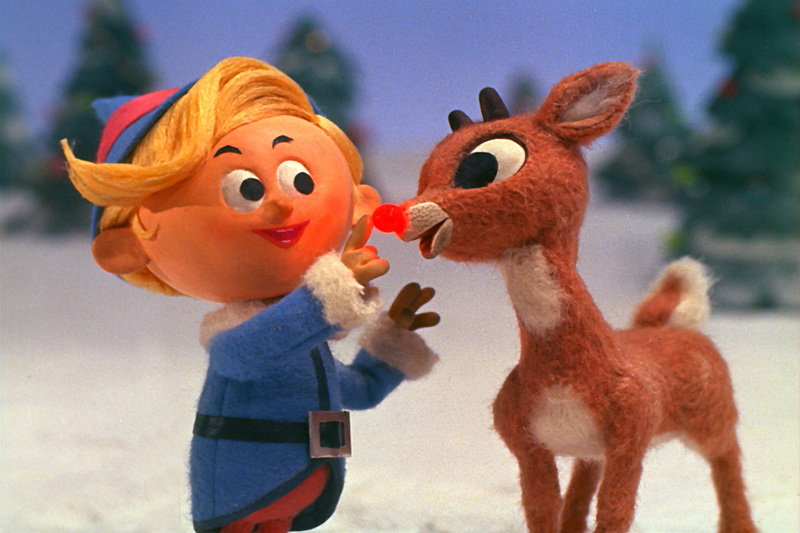 Hermey the dental elf, Yukon Cornelius, the Abominable Snow Monster, and the Island of Misfit Toys are as indelibly related to as many home viewers’ conception of televised Christmas as Santa’s sleigh, the reindeer, and the North Pole. Rudolph the Red-Nosed Reindeer may pay story service to such otherwise acceptable themes as belonging, acceptance, and a special, glowing, sleigh-leading gift, but I think the real appeal of this fractured fairy tale lies in the equally bizarre and fantastical nature of the world it brings to stop motion life; where a winged lion gathering all the disused, unwanted toys of the world to his snow isle resides in the same story as a worried, irritable Santa Claus who Mrs. Claus is trying to fatten up for Christmas. 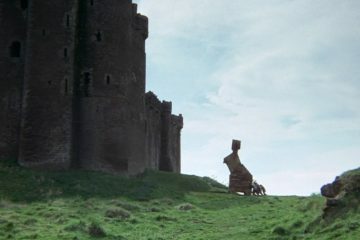 (Regarding the former and the latter, isn’t it rather odd that a sudden rash of malfunctioning toys and an alarming lack of productivity at Santa’s castle could both be traced to a certain dental-obsessed elf daydreaming on the job?) And really, to get this far without mentioning Burl Ives’ Sam the Snowman and his musical rendering of Rudolph’s “nonconformity” shows there’s a lot more going for this classic Christmas special than merely serviceable holiday cheer. A silver and gold 9.5. Bemoaning commercialism and a lack of meaning ’round the holidays, perpetually downbeat Charlie Brown speaks for everyone come Christmastime with a spirit-crushing “sigh”. His little sister Sally wants cash (“tens and twenties”) for Christmas, while bossy neighbor girl Lucy desires real estate, and even his beagle Snoopy has entered a crass competition for garishly decorating his doghouse. But of course his blanket-wielding friend Linus is on hand to explain “what Christmas is all about, Charlie Brown”, courtesy of a dramatic spotlight and an equally dramatic reading of the New Testament, and even if the only real Christmas tree on the lot is a scraggly little branch, it nonetheless retains enough spirit of the season to (eventually) inspire his cynical compatriots to a rousing chorus of “Hark! the Herald Angels Sing”. If I’ve ever had a “sigh” of my own regarding animated holiday specials, it’s that I can’t go back in time and watch A Charlie Brown Christmas during its December 9, 1965 broadcast premiere with entirely fresh eyes of seasonal delight. Vince Guaraldi’s eternally cool cool jazz (not a redundancy, by the way), a score-supreme which actually sounds better every year, sets the perfect tone for the Peanuts Gang’s poetic and melancholy brand of Christmas Cheer, which I’d further argue has set a standard for our enjoyment of the season through the latter half of the twentieth century right up to the present day. A Linus & Lucy 10. Giving voice to the ultimate Christmas outsider, horror legend Boris Karloff’s reading of Dr. Seuss’s classic text brings the green-bodied envy of the terrible Grinch to vivid and sneering life. (A sardonic narration, I should add, that I now realize entirely shaped my later taste for quirky comedy and literary wit.) 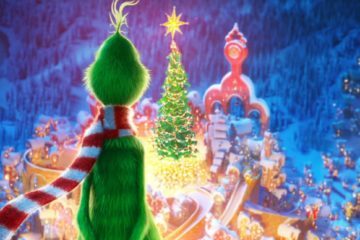 Yes, all those “Whos down in Whoville” are to be admired for having fashioned an apparently utopian community that embodies the Christmas spirits of goodwill, charity, and cooperation all the year ’round, but consider that unrepentantly selfish and wholly ingenious miser looking down on them 2,000 feet above from his comfortable ice cave. And, furthermore, just think how easily that long-suffering creature, forced to listen to irritating Who-carols echoing off the mountain peaks 365 days a year, makes off with the entirety of the Whos’ holiday bounty with a poorly-tailored Santa costume and a little dog unconvincingly fitted with a reindeer antler. Seriously, though, I love the Grinch both before and after his “seasonal conversion” and actually find the subtext of the misbegotten social pariah brought into the conformist fold a tad disturbing, if only tempered by the notion that the Whos’ unrelenting sweetness and light will undoubtedly undergo a mild change itself under the green one’s darker influence. Inspired, one imagines, by five years of increasingly higher ratings with annual showings of UPA’s Mister Magoo’s Christmas Carol, Rankin and Bass followed up in 1967 with their own take on a seasonal Charles Dickens tale. While “The Cricket on the Hearth” is by far the less familiar among Dickens’ 1840’s Christmas Books, the decades-long story about a toymaker named Caleb Plummer, his daughter, her absent suitor, and the magical cricket of the title who witnesses it all might have made an interesting hour-long TV play, but as an animated special fails to sustain interest for either adults or kids by trying too hard to please both. Even the usually reliable Romeo Mueller script and tuneful Maury Laws songs become wearying over the special’s 50-minute running-time, as this viewer was distracted from the story on hand by lingering and entirely unrelated questions of the advisability of, say, mixing the worlds of anthropomorphic cartoon animals with a serious family-related story about pain and loss through the years. The head-scratching nadir came for me when, for some inexplicable reason, the cricket is abducted by some gangster rodents and dumped into the ocean while the London animal underworld celebrate in a sleazy Victorian music-hall. Dickens, or even Christmas, I am sorry to report, this is not. “Reverent” and “cartoon” don’t mix well for this particular viewer, possibly explaining why I failed to respond to this well-regarded Rankin and Bass stop motion production. Once again embellishing on a popular Christmas tune, though this one a good deal more religious-based than the secular Rudolph or the later Frosty, The Little Drummer Boy adds a backstory for the title character, here named Aaron, whose parents are killed and his house destroyed and who, as a homeless, embittered orphan, is forced to wander the desert wasteland during the last few months of Jerusalem B.C., accompanied only by his pets camel, donkey, and lamb. Having joined a sketchy performing caravan, where Aaron of course plays his drum, The Little Drummer Boy soon joins three kings who are following a star to some hole-in-the-wall called “Bethlehem” where, lacking any other gift but his talent to bestow, beats out the percussion soundtrack to the birth of Christ. Well, I do wish I might have enjoyed this apparently heartfelt animated effort a bit more, personally finding the grim proceedings a trifle glum, but instead I’ll try to give this special’s numerous fans the benefit of the doubt by refraining from further comment. Having enacted an oddly grouchy supporting role in Rankin and Bass’s previous Rudolph, Santa Claus, here voiced by Mickey Rooney, throws down the jolly red-velvet gauntlet by definitively revealing the wheres, hows, and wherefores of his elf-leading, reindeer-driving, toy-giving secular sainthood; from the humble red-headed orphan raised by the toy-making Kringle Elves to the sometimes jolly, usually overweight king of Christmas who settles at the North Pole. On-screen narrated and sung by Fred Astaire as S.D. 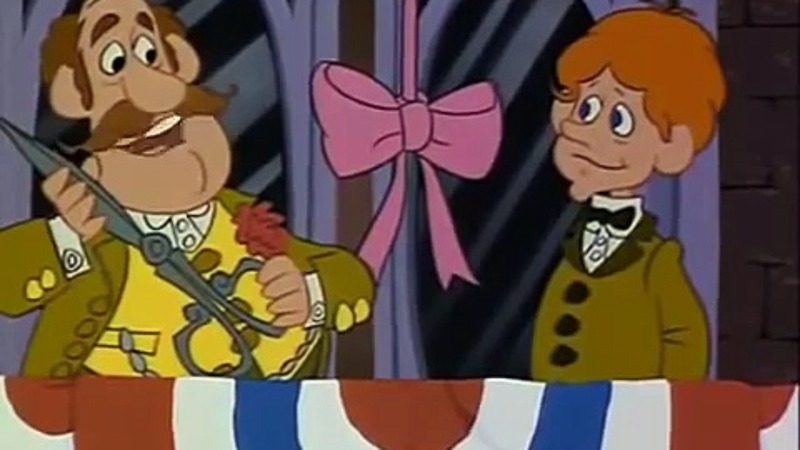 (“Special Delivery”) Kluger, the title song is marvelously and magically embellished in the near-best Rankin and Bass stop motion tradition to include such characteristically quirky inventions as Burgermeister Meisterburger, the Winter Warlock, and a surprisingly fetching love interest in the youthful Miss Jessica, who of course becomes Mrs. Claus. Though essentially an origin story burdened with a top-heavy assortment of exposition – screenwriter Romeo Mueller unenviably saddled with explaining narrative elements as diverse as chimneys, stockings, and even the iconic white beard – Santa Claus is Comin’ to Town! 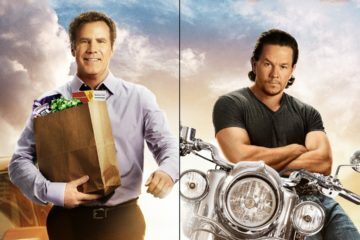 nonetheless earns the exclamation point of its title as highly enjoyable seasonal viewing. 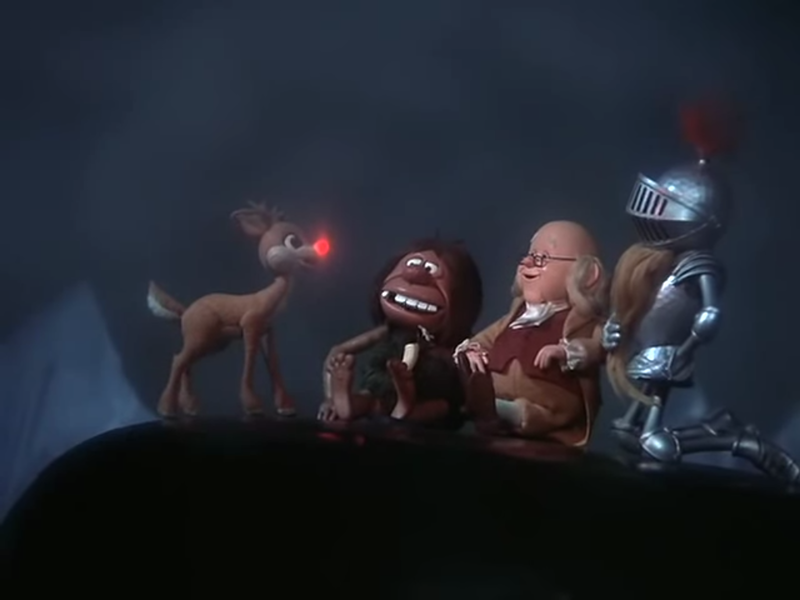 One of the more unusual aspects of watching the Rankin and Bass Christmas specials back to back like this is noticing a complicated holiday mythology emerge, with secular counterparts to the angels, shepherds, three kings, and stable animals of the Birth Story found in the reindeer, snowmen, elves, and wizards of the North Pole. Courting blasphemy further (because, by this point, why not? ), if the pagan/elemental holiday world of Rankin and Bass has its red velvet-furred, portly, gift-giving deity, that sprightly Spirit of the North is undoubtedly Santa Claus himself. More man than god, however, The Year Without a Santa Claus finds jolly ol’ saint nick tired of his vocation, desiring to just stay in bed for the next year, and ready to hang up the red hooded-mantle forever. With querulous weather twins Heat and Snow Misers causing trouble, and barely restrained by their terrifyingly tea-sipping mother Mother Nature, it’s left to Mrs. Claus to set things right both in the North Pole and the equally troubled town of Southtown, restoring order to the magic, weather, and human realms alike. 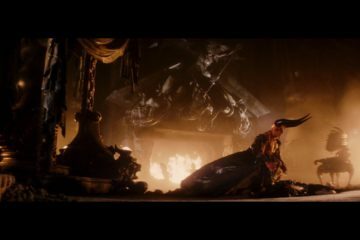 As the real hero, or rather heroine, of The Year Without a Santa Claus, Mrs. Claus, voiced by Shirley Booth, definitively shows that behind every man/god there is an equally formidable woman/goddess. 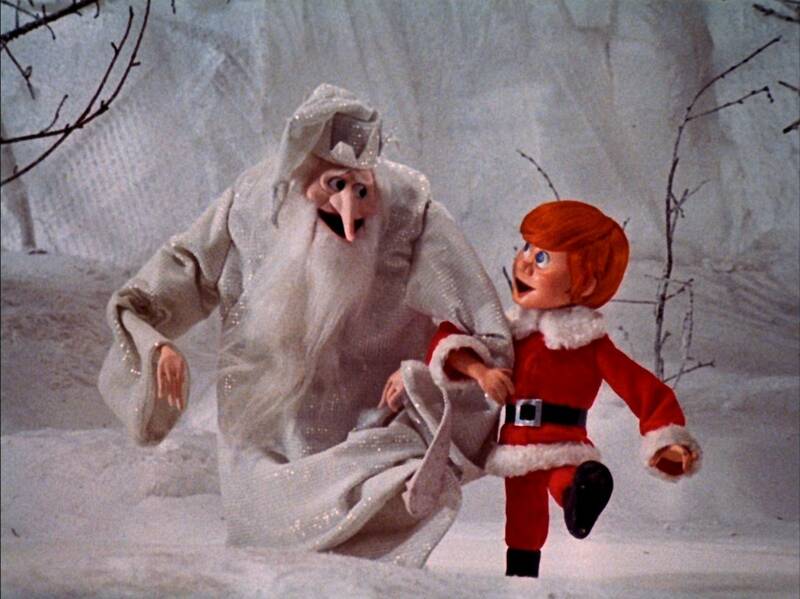 Rankin and Bass’s second-most memorable hand-drawn animated Christmas special, after Frosty, takes on the oldest secular Christmas poem, 1823’s A Visit from St. Nicholas, for the nineteenth century, smalltown America-set tale of the Trundle family and their home-sharing mouse counterparts, the Mouses. As one of my co-workers puts it, rounding out the “Santa is a jerk” subtext of many Rankin and Bass seasonal tales here finds Santa Claus ‘skipping over’ the otherwise unoffending town of Junctionville, having apparently taken grave and prickly offense to an unbelieving missive penned by the youngest and brainiest Mouse son Arthur for the local gazette. Well, it’s up to the clock-making Mr. Trundle, with later cooperation from the Mouses (and particularly young Arthur Mouse), to arrange an elaborate clock-playing apology to the flying-over Santa on Christmas Eve. 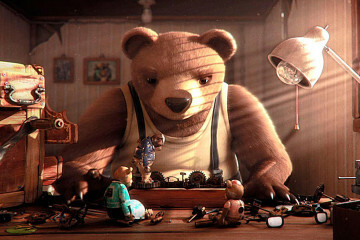 On par with The Year Without a Santa Claus for evoking a smalltown American Christmas, while also addressing/redressing the aftereffects of blustery Santa dudgeon, the specials originally aired a few days apart from each other on competing TV networks, to the possible confusion of contemporary viewers who thought they may have recently seen a similar animated story in stop motion form. However, with the magic of home video you can now view them back-to-back, which might be the best way to experience the combined charms of both Southtown and Junctionville on Christmas. A miniature sleigh and 8 tiny reindeer. 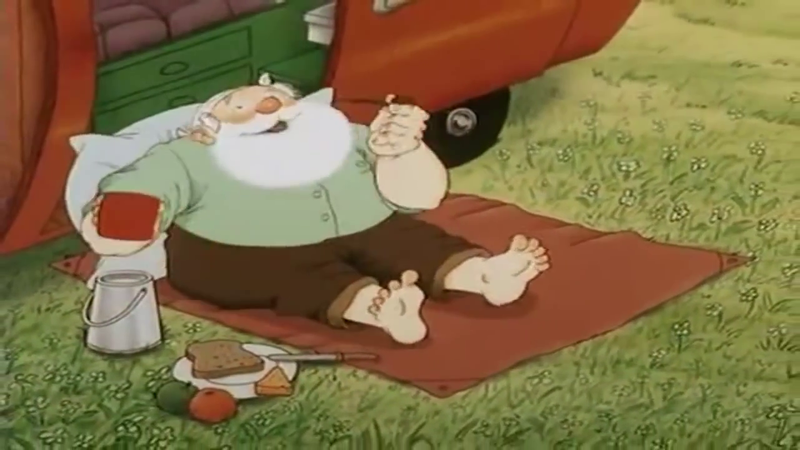 Intended as the culmination of Jules Rankin and Arthur Bass Jr.’s stop motion house animation style, which by this time the studio had dubbed “Animagic”, this narration-stated “direct” sequel to their initial small-screen seasonal success is technically more a New Year’s than a Christmas special, but its North Pole setting and return of Rudoph and Santa has enough of a winter wonderland feel to be interchangeable with either holiday. Dramatizing the week between Christmas and the New Year, Santa, voiced here by Paul Frees, dispatches Rudolph, fresh from his glowing-nosed sleigh-leading, to assist Father Time, voiced and narrated by Red Skelton, find the lost Baby New Year, a big-eared infant inaccurately named Happy, before the stroke of midnight on December 31st, or risk an eternity of stopped motion non-animation. The meta-premise of time-stasis, along with the increasingly complicated allegorical mythology that Rankin and Bass had by now indulged in, literalizing time, seasons, and even the elements with a bewildering array of eccentric cartoon characters, results in such clever and quirky creations as the Archipelago of Last Years, the villainous vulture Eon, and the caveman OM (AKA One Million B.C. ), but yet the level of invention possibly seems too prodigious at times, and occasionally distracts from its main story line. 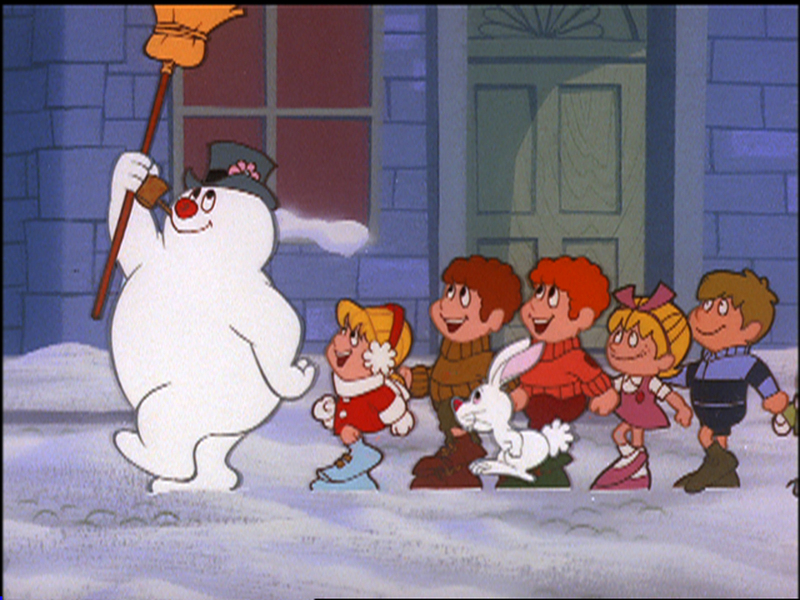 The “magical winter wonderland” referenced in my description of the original Frosty finds its logical place in Rankin and Bass’s sequel to their earlier Christmas classic, which of course combines two novelty Christmas tunes for the price of one. With only ever-so-slightly diminishing returns as on-screen narrator Jimmy Durante is replaced by a game and folksy Andy Griffith, so too is the innocence and childlike fun of the original ever-so-gently compromised by Frosty’s quite literal creation of a wife/snowwoman named Crystal, voiced by Shelley Winters (and I wonder, by the by, if the actress’s last name had anything at all to do with her casting, or was it merely a happy coincidence?). But a bouquet of frost flowers, the return of Frosty’s gang of sympathetic kids, and the clever addition of one Parson Brown, along with his snowman simulacrum, both voiced by Dennis Day, retain much of the holiday charm of the original for this first-time viewing, while also leaving me pining somewhat for the absently hissable and mustachioed villain Professor Hinkle and his silently expressive trick rabbit Hocus. 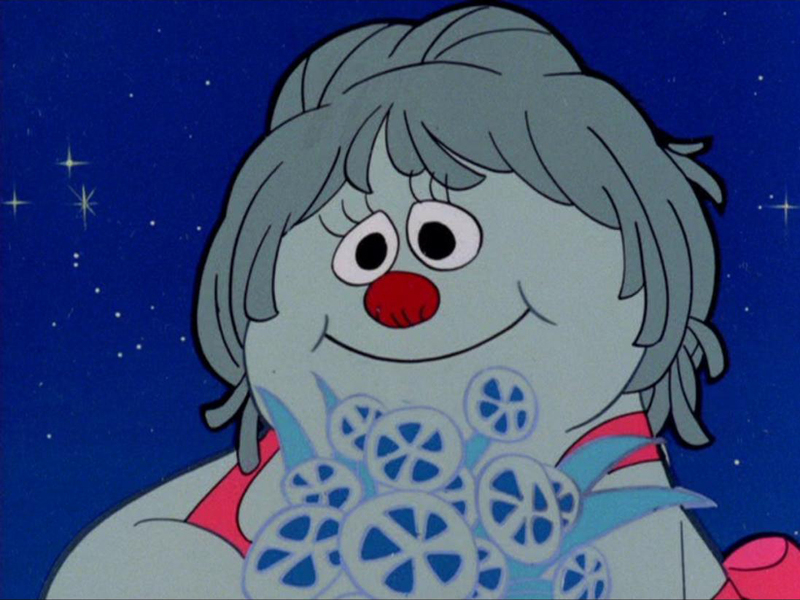 On hand to balance the latterly villainous black hole, however, is the introduction of the jealous Jack Frost, voiced by Paul Frees, who in turn restores some of the winter magic of the original with each icy-tinged breath. 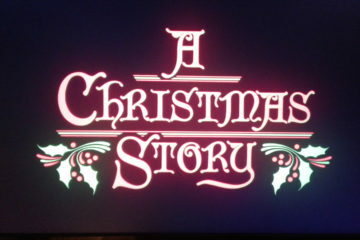 While technically not an animated Christmas special, Jim Henson’s master puppetry at least bears comparison to the more, by then, established stop motion holiday animation popularized by Rankin and Bass, so I’m not hesitating here to call the Muppet creator’s initial bid at seasonal cheer a real-time Christmas animated special. 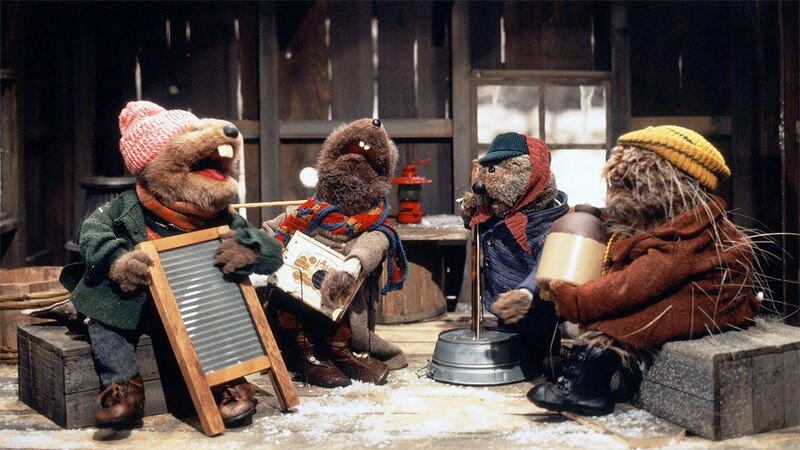 Based on a 1971 children’s book by Russell and Lillian Hoban, Jug-Band Christmas tells the story of Emmet and Ma Otter who subsist in the backwoods locale of Frogtown Hollow, and who conspire to afford Christmas presents for each other by separately entering a holiday talent show contest. Charming, offbeat, and unruly in the best Muppets tradition, this Southern-fried variation on The Wind in the Willows contains enough reality and emotion to tug at the heart strings, while not stinting on such delightful nonsense as The Riverbottom Nightmare Band, and especially Frank Oz’s growling performance of rock ‘n roll frontman Chuck Stoat, as the 50-minute special moves to its entirely earned (and refreshingly unexpected) happy ending. Originally presented and on-screen narrated by Kermit the Frog, with catchy songs by The Muppets best musical interpreter Paul Williams, Emmet Otter’s Jug-Band Christmas shows the genius of Jim Henson and The Muppets working in a slightly different milieu than variety television, and looks forward – I would say rather brilliantly – to more ambitious later Henson Studios productions such as Dark Crystal (1982) and Labyrinth (1986). 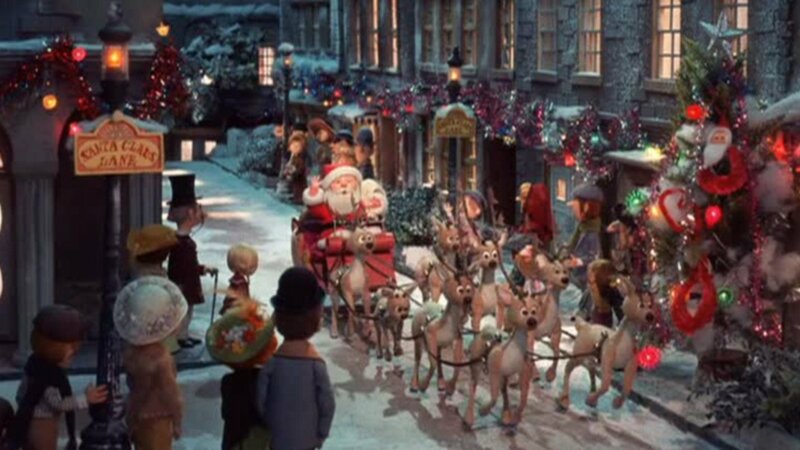 Following Rudolph, Rankin and Bass adapt a second novelty Gene Autry Christmas tune about “difference” and “proving oneself”, while also revisiting the Bethlehem models of The Little Drummer Boy and its sequel, in a late stop motion entry that failed to hold this viewer’s interest as either a quirky children’s fable, complete with a Roger Miller singing narration, or as a reverent story about the titular long-eared donkey, who carries a certain expectant couple through a desert sandstorm. 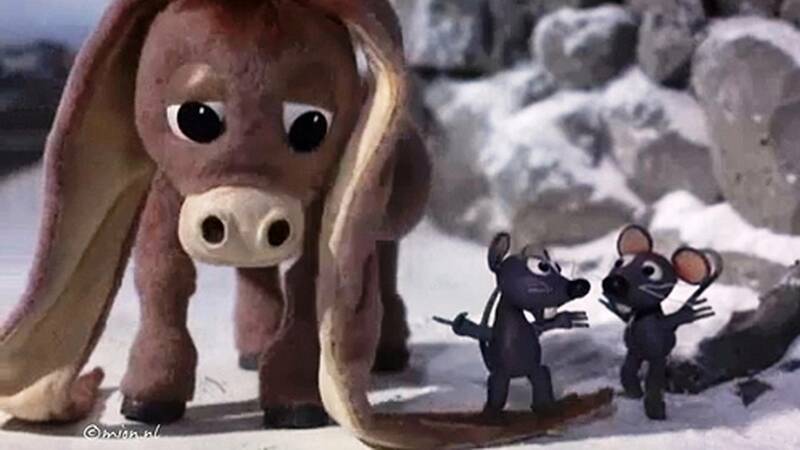 Again, from the laughing abuse hurled at ear-tripping Nestor by Roman Centurions in its opening scenes to those same big ears leading the holy pair to the fateful stable, this Rudolph/Little Drummer Boy redux has some charming animation but lacks the funny character moments that made previous attempts at this type of story memorable. Failing to find the proper balance between entertainment and reverence, Nestor, the Long-Eared Donkey is neither as dramatically interesting nor even as simply fun as the Nativity Play your kids entertainingly blundered through last year. I like to imagine cartoon illustrators Tom Wilson and Robert Crumb toiling away a few desks away from each other at the same Cleveland, Ohio American Greetings Card office in the early ’60s, one dreaming of revolutionizing the form and substance of comics with future LSD-inspired creations like Mr. Natural and Fritz the Cat and the other plotting to make millions with an amorphous and characterless man-blob called Ziggy. Never a fan, I must admit, my main insight into Ziggy’s most unusual and uncharacteristic Christmas special is the surprising involvement of songwriter Harry Nilsson and master animator Richard Williams (A Christmas Carol, Who Framed Roger Rabbit?, The Thief and the Cobbler), who in a strange pop cultural irony infuses this downbeat and sometimes downright depressing holiday fable with a realism and social criticism more characteristic of the work of underground comics artists like the aforementioned R. Crumb. With its big (unnamed) city locale and sleazy big (also unnamed) city characters, Ziggy’s Gift navigates the murky depths of exploitation, corruption, and poverty ’round the holidays while the title character, in his first and to my knowledge only Christmas special, becomes innocently embroiled in a fake Santa money-making scheme, somehow managing to pull a happy ending with gift-givings to orphans at its emotional finish. Fluid, highly-realistic though evocatively stylized animation sets Ziggy’s Gift apart among other Christmas programs, and instead is possibly the first-ever holiday cartoon where artistic expression and deep creativity take immediate precedence over advertising space and selling toys. 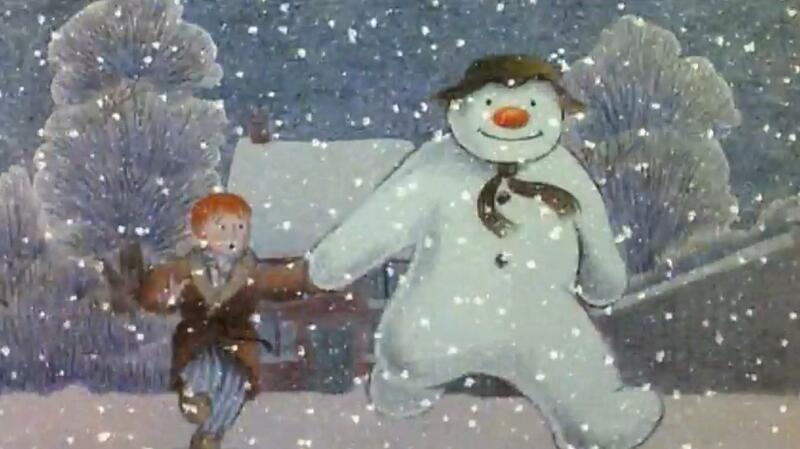 Adapting Raymond Briggs classic 1978 children’s picture book, the multiple award-winning, Academy Award-nominated holiday short The Snowman is, in terms of animated Christmas specials, the flip-side of Frosty, substituting poetry and melancholy for entertainment and whimsy, but both are in their individual fashions equally valid evocations of childhood’s most familiar, Golem-like fairy tale, the bringing to life of three human-height sections of hard-packed winter snow. Retaining the book’s device of telling The Snowman‘s story without words, this winter-set children’s fantasy tells its deceptively simple story without dialogue, as the unnamed boy (here named “James” on a package from Father Christmas) makes his snowman one brilliantly-glowing, snow-falling morn only to find that he has come to life on the stroke of midnight that very same winter’s eve. Not only has animated snow never fallen quite so beautifully on film, but the tender relationship that arises between the boy and his snowman, especially as the former gives a demonstration of a motorcycle or a proud tour of his house to the confused curiosity of the latter, quite literally takes wing, resulting in this viewer’s humble opinion the most magical winter sequence ever captured on film with the boy and snowman’s flight to the North Pole. While the devastating ending made me cry when I first saw the movie as, appropriately, a first grader just before that year’s winter break, to this day I have never forgotten the magical gathering of snowpeople at the boy and his snowman’s winter paradise destination, which I attempt annually to comfort myself with when, say, receiving weather reports of coming winter storms. The absolute first of all these Christmas specials I recall seeing during its original airing, I was smack-dab in the midst of mid-80s Garfield mania as a 10-year-old when watching A Garfield Christmas in December of 1987. The daily comic strips, the book collections available on my monthly Scholastic book orders, and the year-round blitz of toys, merchandise, and advertising made the grossly overweight, hopelessly lazy, Monday-hating, lasagna-scarfing feline cartoon character virtually omnipresent for the duration of my extreme youth. And while I was a fan, the questionably commercial aspect of the character (and his marketing) was probably lost on me while near-simultaneously first viewing A Charlie Brown Christmas, which famously decries commercialism around the holidays. 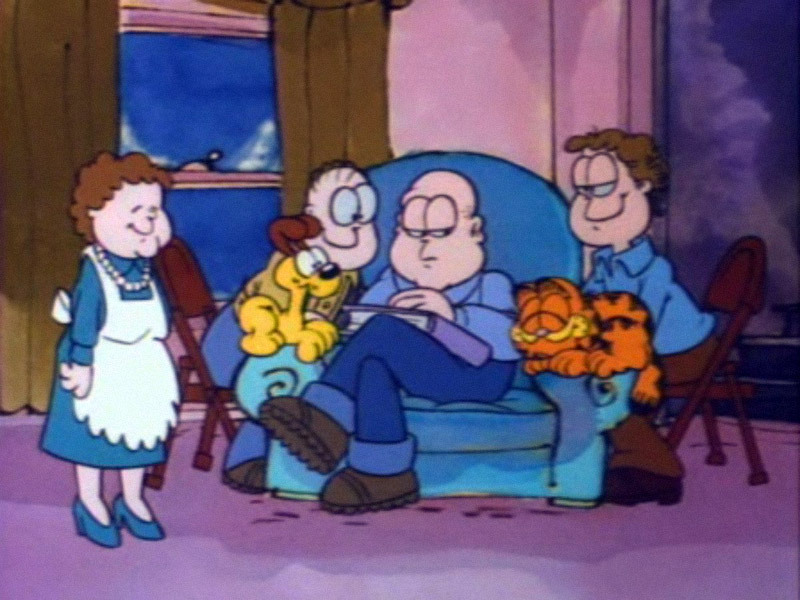 In his first Christmas special, however, Garfield, Jon, and Odie are on their way to an old-fashioned country Christmas on the farm with Maw, Paw, Jon’s brother Doc Boy, and even Grammaw that remains emotionally resonant for this viewer, and is still funny enough to earn a belly laugh when the grown boys insist on Dad’s annual reading of Binky: The Clown Who Saved Christmas. A Midwesterner myself, A Garfield Christmas brings to life its downhome setting as near as it’s possible on a very eighties, commercially-oriented holiday special. 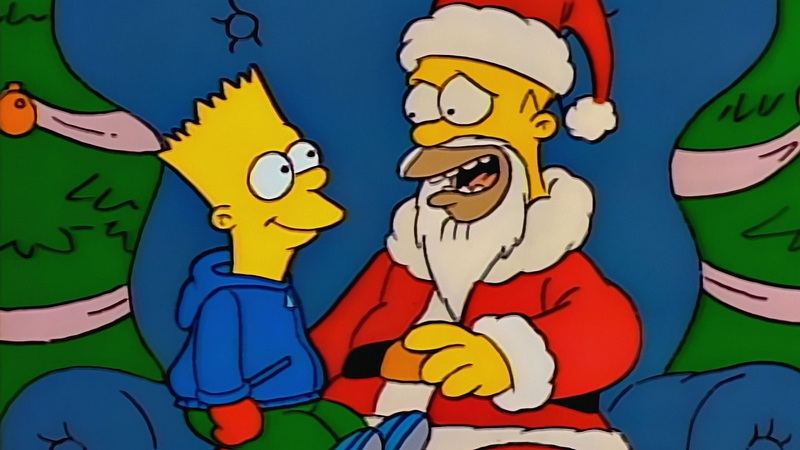 Like a ticking seasonal timebomb waiting to blow up the TV broadcast-scape of the eighties, the premiere of the first sitcom-length episode of The Simpsons not only eviscerated its very family sitcom format, but also tore a satirical streak through the by then long tradition of animated Christmas specials as a nice bonus. Like my first issue of Mad, the first time I read Kurt Vonnegut, or, a few years later, had my mind blown by Dr. Strangelove, Or How I Learned to Stop Worrying and Love the Bomb (1964), my first viewing of The Simpsons and its suitably subversive Christmas Special was appropriately earth-shattering, with, as I recall, a Goldfinger-like laser beam gizmo aimed at bratty Bart’s “MOM” tattoo prompting me to ask my own mother, “Are they allowed to do that?” From Homer not getting his Christmas bonus, and having to take a hilariously crappy mall Santa job, to Homer and Bart betting the family’s entire Christmas fund on a greyhound racer named Santa’s Little Helper, who of course places dead last (and subsequently becomes a Simpson himself), the balance of realism and dead-on parody of The Simpsons‘ early seasons is in ample evidence, if not yet reaching the giddy heights of subsequent episodes. Bart’s passionate defense of animated holiday specials mid-way through the episode, and their ability to provide “Christmas miracles” for “poor kids” like himself, Charlie Brown, and The Smurfs, is I believe the first time I experienced a “meta-moment” on broadcast TV, and for which I also recall feeling distinctly proud that my 12-year-old self could recognize and laugh along with a medium laughing along with itself. As might be implicitly apparent from many of these animated Christmas special mini-reviews, I’m actually a trifle ambivalent about the Rankin and Bass holiday output, where brilliance (Rudolph, Frosty), sloppy indifference (Drummer Boy), and outright excrescence (Cricket, Nestor) reside in equal measure; finding in even their best work inconsistencies in pacing and characterization, especially, that inevitably grate on my viewing nerves while watching (and sometimes suffering through) them. Which is why I shouldn’t be opposed in principle to a rival animation studio taking a seasonal stab at possibly Rankin and Bass’s most famous creation, that of Frosty himself, but unfortunately the less said about this unpleasant early ’90s attempt at reviving the “magic” of earlier holiday specials the better. 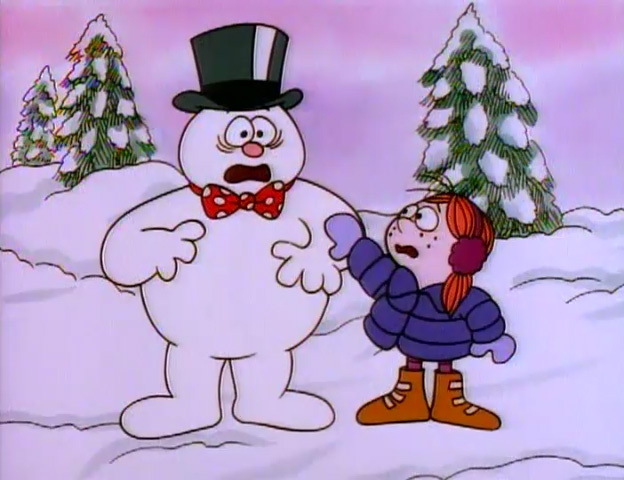 A cynical cash-in by CBS and Lorne Michaels’ Broadway Productions (Saturday Night Live), not even John Goodman as the voice of Frosty, nor the otherwise sterling work of co-director Bill Melendez (The Peanuts Specials), could convince this viewer that a snowman could “come to life one day”. If nothing else, this special succeeds in making one appreciate the legacy of Rankin and Bass all the more, which one supposes is all to the holiday good. 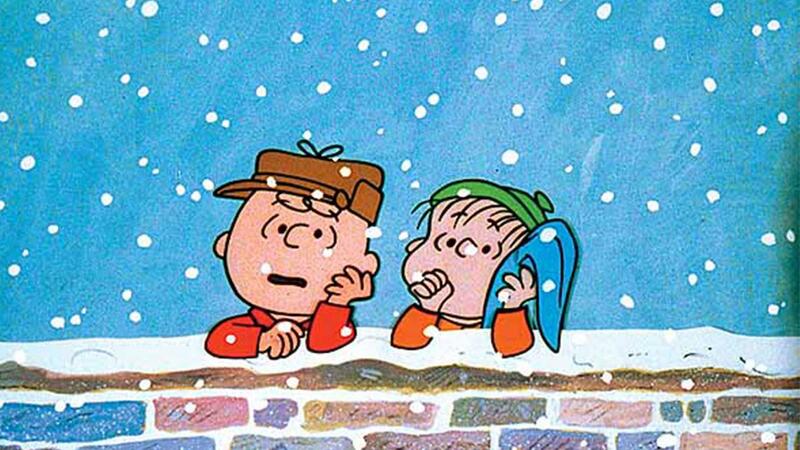 My brief window of watching animated holiday programs apparently closed a few years before It’s Christmas Time Again, Charlie Brown aired, making this the first time I’d heard of a second Peanuts Christmas special. 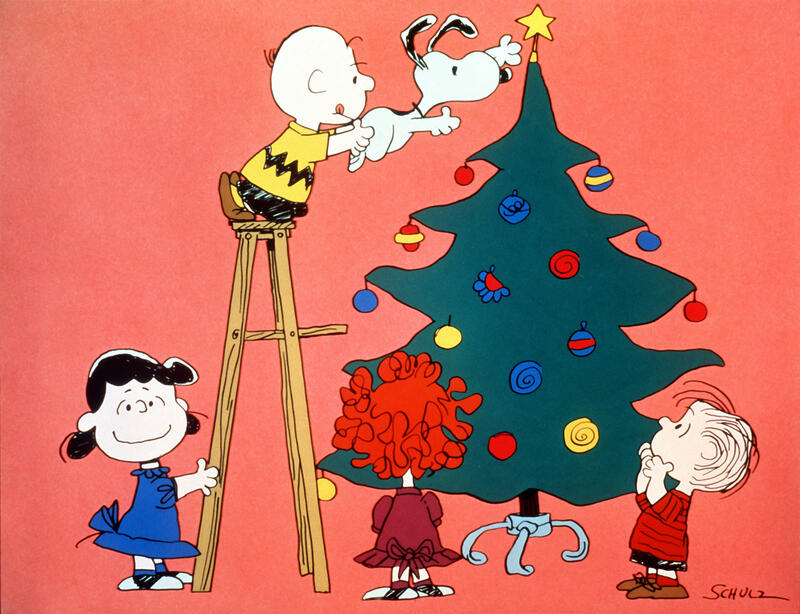 As my love for the Peanuts Gang knows no bounds, and as I have in particular been a lifelong identifier with the lonely plight of that Charlie Brownest of Charlie Browns, the discovery is of course like catnip to me, and I could probably watch 25 minutes of Snoopy, Schroeder, Peppermint Patty, and the rest simply decorating a Christmas tree with something approaching unabashed yuletide glee. As it is, however, this is much much better, with the child’s world panorama of Charles M. Schulz’s peerless daily-strip creation giving equal time to all the major Peanuts Players around the Christmastime of the title. With Charlie Brown selling wreaths door-to-door, Snoopy playing Santa on the street, a Santa letter-writing Sally coming to the conclusion that Santa’s wife’s name is (of course) “Mary Christmas”, among many many other seasonal vignettes – we even get to actually see the Christmas Play that was only in dress rehearsal from the first special – Christmas Time Again is like one of those Peanuts paperback collections I obsessively pored over as a kid sprung, once again, to vivid animated life. A solid Linus & Lucy 8. I suppose my true Christmas gift this holiday season is the discovery of a third Peanuts holiday special, which I must admit, in a very roundabout way, to enjoying for very special reasons. In short, I am that rarity among staunch Peanuts admirers of being a Rerun fan. (I actually find it refreshing and hilarious that with crabby, bossy older sister Lucy and thumb-sucking, philosophizing older brother Linus, Mr. and Mrs. Van Pelt should have produced such a relentlessly normal child on their third try.) 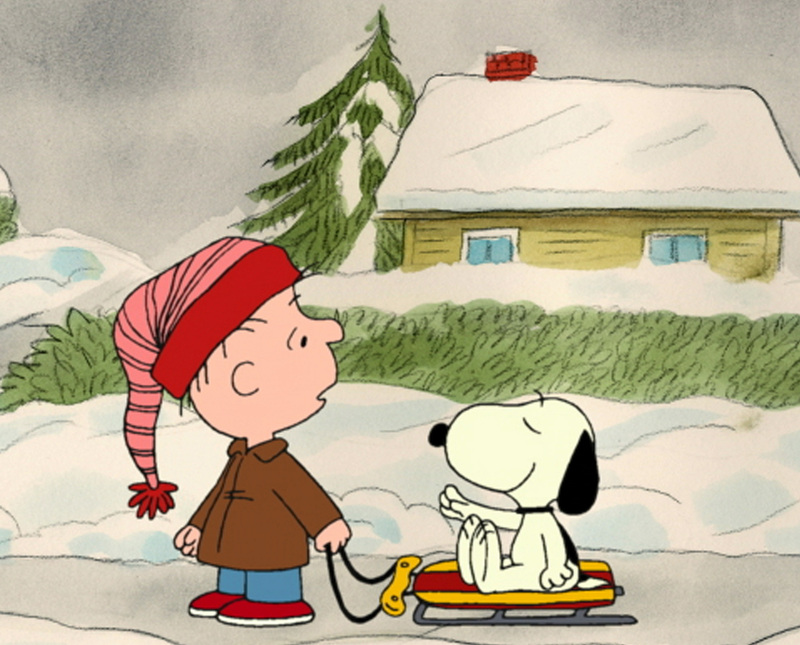 And as I Want a Dog for Christmas, Charlie Brown is as much Rerun’s special as the original’s was Charlie Brown, this Rerun-centric Christmas is enjoyable on its own terms for being rooted in a common childhood desire: wanting a dog despite your parents hating them. Snoopy, followed by Snoopy’s desert-dwelling brother Spike become the objects of the loneliest kid on the block’s desire, which in true Peanuts Holiday Special tradition has a realistic outcome where no one quite gets what exactly they want, but happiness and hope nonetheless continue in their trudging way to somehow reign supreme. Despite a few missteps and some jarring contemporary cultural references, I do apologize, folks, but I simply cannot criticize Charlie Brown and Co., nor their unique brand of bittersweet seasonal cheer: for me, it is simply beyond reproach. 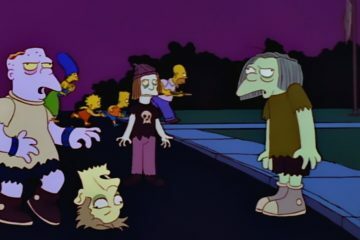 The Trivial Terrors of The Simpsons’ “Treehouse of Horror III”!